More through blind luck than capability or planning, Dwight manages to kill his target; but that is only the beginning of his problems. The ex-convict's family, the Clelands, are numerous, belligerent, and ready to take their revenge in turn. Meanwhile, Dwight begins to discover the events around his parents' murder were more complex than he knew. Dwight himself could simply disappear or surrender to the police, but he is concerned for his sister, Sam. It is strongly implied they were both very young when their parents were killed, in their teens at most. It is clear Dwight never learned to cope with the trauma and became a vagrant. In contrast, Sam has built herself a comfortable life, with a pleasant house and two children of her own. If the Clelands cannot find Dwight, they may well take vengeance on Sam. Above all else, Dwight wants to protect his sister and her children from the danger he has brought their way. He is destitute, frightened and vulnerable, physically weak and incompetent with a gun, but determined to see his course of action through to the end. This film is a masterpiece of slowly building tension. On the way to the final confrontation it has one gripping set-piece after another, punctuated by the blackest of humour. It makes great use of its setting in the quiet suburbs, countryside and forests of Virginia. We occasionally catch glimpses of the mundane world, which carries on peacefully alongside this gritty tale of revenge. The realism of Blue Ruin extends to the violence. It avoids the bloodless pantomime of a superhero movie, and the voyeuristic dwelling on gore and injury which we might see in a horror film; but it is made very clear that characters are really being hurt. The prospect of death is brutal and ugly, and gives us a visceral understanding of Dwight's fears. 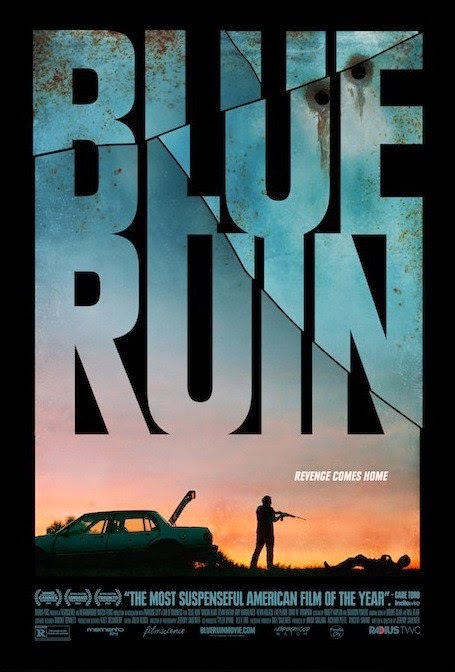 Blue Ruin is the second film by writer-director Jeremy Saulnier. (His first was Murder Party, a micro-budget effort which went straight to DVD, but on the basis of Blue Ruin may be worth seeking out.) This film is being widely likened to the work of the Coen brothers, but a better comparison may be a young Peter Jackson or Sam Raimi. In any event, his future career deserves to be closely watched.